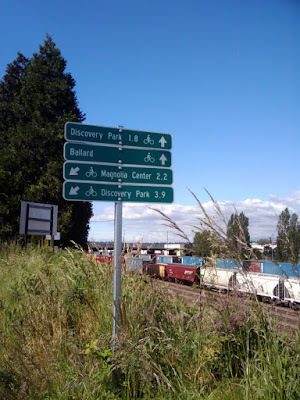 The main waterfront trail route along Puget Sound in Seattle is the Elliott Bay Trail, a scattered collection of trail segments that run from Smith Cove in Magnolia, along the railroad tracks in Interbay, back to the water and into Myrtle Edwards Park where a very nice portion of the trail connects to Alaskan Way, then runs sporadically to King Street where a newer segment runs west of the 99 Tunnel construction work before connecting with the bike lane East Marginal Way and onto the West Seattle Trails. Those trails continue along the water over the lower West Seattle Bridge and continue on to Alki Beach. The total length from Smith Cove to Spokane Street is about 7.5 miles. The ride from Spokane Street to Alki Beach adds another 5 miles. If you only ride one of the segments, or you don't want to do a long ride, this is your best option. The path is nice and wide, walkers and wheels are separated, and on a nice day the scenery is amazing. Type: Paved trail, flat the entire way with some rough pavement, rail crossings and narrow trail for northern portion beyond Garfield; overall good visibility and limited street crossings. 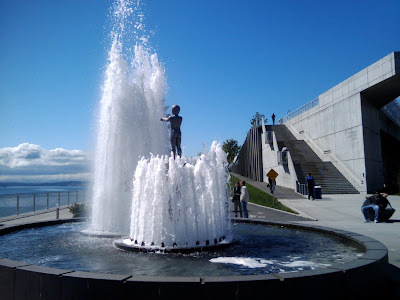 Route Summary (south-to-north): The southern starting point is the Sculpture Park, the entrance to the trail is just to the right of the fountain and easy to spot. The route follows the water through Myrtle Edwards Park and then turns north along the railroad tracks and into Magnolia. A short distance in, there is a nice overpass that provides an easy connection to Lower Queen Anne (3rd Ave W) over 15th. If you decide to follow the approximately 1.3-mile spur trail to the cove, you'll be rewarded with a nice viewpoint. Route Summary (north-to-south): If you start at Smith Cove, it's about 4 miles back to the Sculpture Park. Here's the combined route map from Smith Cove to the Sculpture Park. 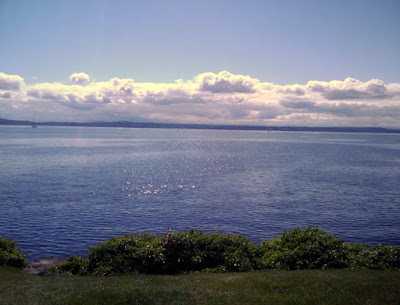 From the cove, you'll continue along the railroad tracks and into Myrtle Edwards park and then follow the nicest portion of the trail to it'd end where it merges onto Alaskan Way. From there you follow the 'downtown' portion of the trail that runs along the waterfront proper, described below. I'm not sure if there is a name for the portion of the trail that runs along the waterfront below the Elliott Bay Trail, or if it's just an extension, especially because, as of 2014, there is constant construction in the area and the trail can be closed or re-routed at anytime. I recommend checking the project page for the 99 tunnel to find the latest updates. The route is safe, you just need to take your time and use the sidewalks and parking lots if you're not comfortable with the traffic. Type: varies, portions are on-street, portions on paved trail/sidewalk. It can get pretty crowded in the summers and more experienced riders may want to just ride the street. Route Summary (north-to-south): once you exit at the Sculpture Garden, the safest route is to ride the sidewalk a block down, cross with the light and ride along the sidewalk on the east side of the road. Once you get past the cruise ship terminal, the sidewalk will turn into a true paved trail. You can easily follow it under the viaduct, and as of 2015, the detour runs on the east side of the road as simply markings on the shoulder. Follow that down to Jackson Street and turn right where the paved trail resumes. 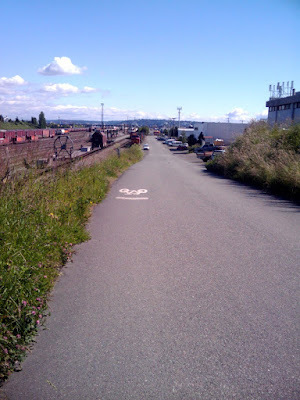 Follow it behind the construction to Alaskan Way/East Marginal where a bike lane and a wide sidewalk run the rest of the way to Spokane St where the paved trail will take you to West Seattle.